Superior performance, energy efficiency and value are the qualities that you can depend on when it comes to the TriStar high performance pump by Hayward. The advanced fluid dynamic design optimizes the three essential pump elements to deliver superior flow, and energy efficiency creating a new benchmark in residential pool pumps. TriStar features the most energy-efficient hydraulics with a revolutionary motor-cooling design for an extended motor life. It's the first pump to feature a Tri-Lock cam and ramp strainer cover with a super sized, smooth, no-rib basket. This extra large leaf holding capacity extends the time between cleanings, giving you more time to relax and enjoy your pool. It also features a dynamic airflow for a quieter, cooler operation and it seamlessly retrofits to almost any existing filtration system. 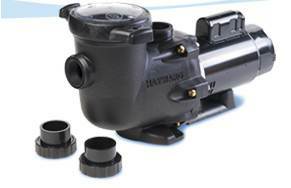 TriStar-Your High-Performance Pump Solution, only from Hayward. Optimizes fluid dynamic technology for superior flow. Seamlessly retrofits into existing bases. Heat resistant, industrial size ceramic seal. Service-ease design gives simple access to all internal parts. Motor and entire Power End assembly can be removed, without disturbing pipe or mounting connections, by disengaging just six (6) bolts. Super-sized basket has extra leaf-holding capacity and extends time between cleanings. Rigid construction assures free flowing operation for heavy debris loads. Smooth inside surface insures easy debris removal. Tri-Lock design makes strainer cover removal easy. No tools required, no loose parts, and no clamps. See-thru strainer cover lets you see when the basket needs cleaning. Test feature allows line pressure test to 50 PSI MAXIMUM. All components molded of corrosion-proof glass-filled polypropylene for extra durability and long life. 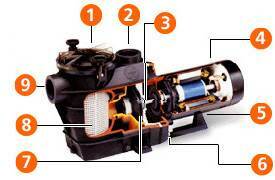 Heavy-duty, high-performance motor with air-flow ventilation for quieter, cooler operation. Mounting base provides stable, stress-free support. In-ground pools of all types and sizes (including in-floor cleaning systems, solar heating systems, water features). In-ground spas or in-ground pool/spa combinations. Note: TriStar Max Rated Pumps include a second base that aligns with STA-RITE, MAX-E-PRO?, MAX-E-GLAS, DURA-GLAS AND DURA-GLASS II ports.